A suicide car bomb exploded outside a military base for Ethiopian soldiers in southern Somalia on Saturday, leaving an unspecified number of casualties, a police official said. Islamist group al Shabaab claimed responsibility for the assault and said it had killed 16 Ethiopian soldiers, although the claim could not be independently verified. A local elder who witnessed the attack told Reuters the explosion had killed 10 people including soldiers and civilians. “The mini bus was very dusty, it must have come from a far region, it was fired (on) as it started speeding up,” he said. 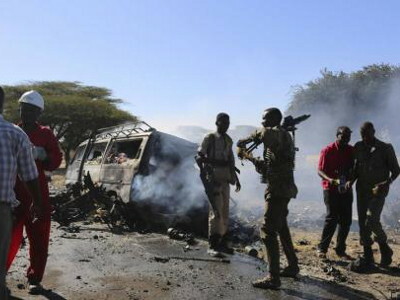 Police officer Major Nur Abdullahi told Reuters from the town of Bardheere where the attack occurred that the vehicle involved was a mini bus carrying vegetables as a disguise. “It was fired (on) before it reached the gate. We understand there are casualties,” the officer said. Al Shabaab is fighting to topple Somalia’s western-backed central government and establish its own rule, based on a strict interpretation of Islamic sharia law. The group regularly stages attacks against the Somali military and against troops from the African Union-mandated peacekeeping force AMISOM. Ethiopia is one of the countries contributing troops to AMISOM, alongside Uganda, Kenya, Rwanda and others. Somalia has been gripped by violence since the early 1990s after the toppling of dictator Mohamed Siad Barre.